I like to plant tomatillos in my garden every summer for a variety of reasons. For starters, I love salsa verde, which is made of tomatillos. They are also a wickedly cool looking plant to have in the garden, because of their dramatically hanging fruit which look like little lanterns. I just spent a few hours over several days looking for a good shot of a tomatillo plant, combing through the last four years of summer garden shots and that is the best shot I had. And it’s not even mine, it’s Leni’s (from summer 2012). 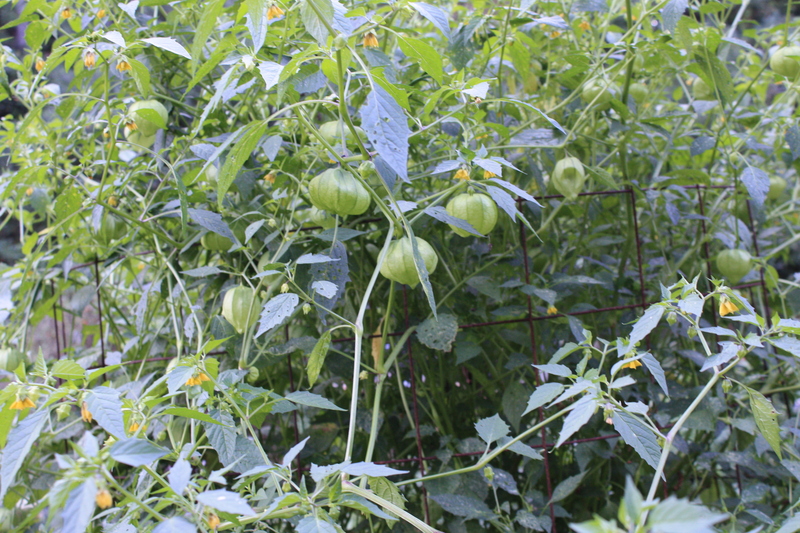 Tomatillos are ridiculously easy to grow, their only stipulation being that they need a mate for cross pollination. The squirrels don’t care for their tart fruit, which means I get quite a harvest every summer. Perhaps my most favorite quality of tomatillos is that you can pop them directly into a ziploc bag in the freezer from your garden basket. Fill up a quart bag or two, date them, run them to a chest freezer in the basement and start all over again because you have a bushel of peaches that week or tomatoes or whatever it is you’re canning and you just don’t want to deal with anything beyond what you have to. This is how I lose track of how many tomatillos I harvested until I decide to organize the freezers come sometime in the fall when the harvest season has slowed down, whereupon I realize I have gallons of them. It’s more than just a few batches of salsa verde, which means if I am going to plant more of them the following summer, we either need to start eating lots of salsa or I need to find other ways of using them up. Which brings me to the recipe I’m sharing with you today. This being January, we are eating out of the freezers as much as possible. One recent cold, rainy night found me staring into the pantry, brainstorming for dinner ideas. I threw out the idea of veggie tacos, which were met with a lukewarm response. It was more of a soup night and I agreed it was. I set out to make some sort of taco soup or chili but ended up with this instead. Admittedly, the first night we ate this, Edie & I were sort of meh. It needed something, so I played around with it some when reheating it for dinner the next night. Bingo! Lime juice & some garnish tweaking resulted in Pat & myself having seconds of the leftovers while proclaiming my cooking genius for having concocted such a delightful meal. It’s one of those dishes that is better than the sum of its parts for sure. Tomatillos have a decent amount of pectin, which is what helps jams & jellies set. You’ll want to keep that in mind if you let this soup sit – which I recommend for it helps the flavors meld. Simply add some water or broth until you get to the consistency you are looking for. 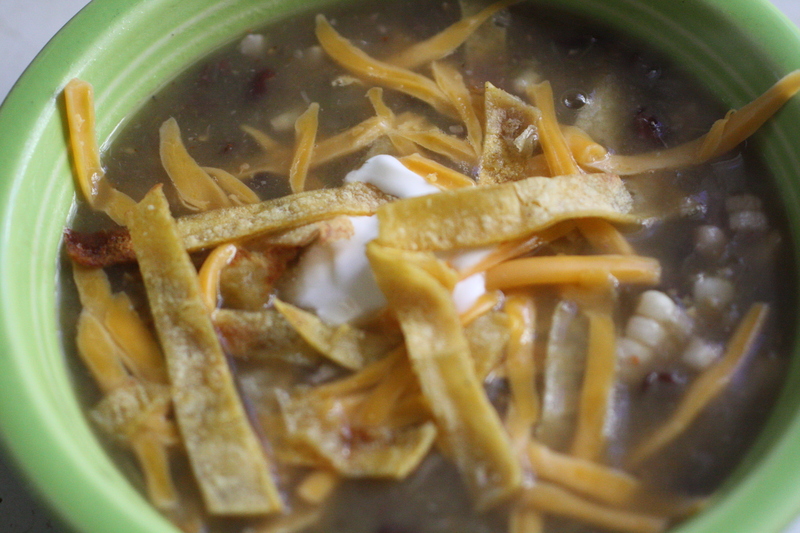 You can make this soup with fresh tomatillos, with no adjustments needed to the recipe. Yet another glorious reason to grow tomatillos this summer in your garden – fresh or frozen, you treat them the same way – throw them straight into the oven or your pot and have at it. I started this soup the same way I start my salsa verde – by roasting halved & quartered tomatillos with some sliced onion in the oven at 350° until they are softened and releasing their juices. You can also do this on the stove top if you prefer. In fact, you could serve a thicker version of this as salsa instead of soup if you’re looking for a good salsa verde recipe. Key to this soup is the toasted tortilla strips garnish. These are so easy to make you won’t want to skip it and they really add a certain something. 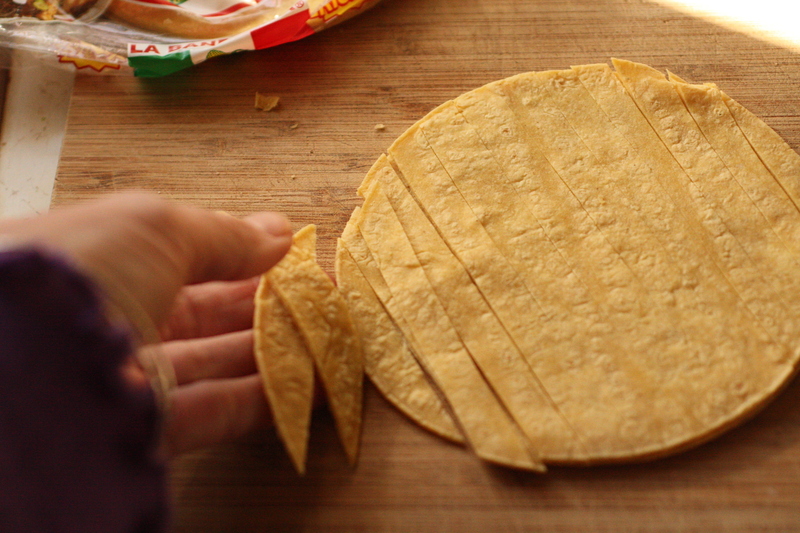 Slice a small stack of corn tortillas into strips. Spritz with some olive oil, sprinkle with salt and spread on a cookie sheet. Bake at 350º for 8-10 minutes until toasted. You might want to make extras, as these tend to disappear from everyone wandering through the kitchen on their way to the dinner table. Two final notes – while I am writing this from the perspective of someone who has gallons of this item in the chest freezers in my basement, you can find fresh tomatillos in the produce section of the grocery store – I’ve seen them there, especially if it’s a store that carries a good selection of Mexican items. I also decided to write this recipe the way I tend to cook – without measuring for the most part. So many of the quantities are guesstimates, but that means you can make this soup your own. Bon Appétit! A quart (or more) of tomatillos, halved or quartered, so that they are all roughly the same size. If roasting, toss tomatillos & onions with olive oil & salt. Roast at 350º until softened, about a half hour or more. If preparing on stove top, heat olive oil in a pot. Add onions and cook for 2 minutes. Add tomatillos, salt and just enough water to keep tomatillos from sticking. Cook until tomatillos begin to fall apart. Puree cooked tomatillos & onions. Place pureed mixture in stockpot. Add water or broth until thinned to the consistency you want (remember, tomatillos contain pectin and will thicken as they cook, so what looks too watery at first will probably be just right when you’re done). Add the juice of a lime, a pinch of sugar, salt to taste, a teaspoon to a tablespoon of chili powder, teaspoon or more of cumin, can or two of black beans and a cup or two of corn kernels & some garlic. Another nice addition is some chilies for extra kick. Over medium heat, bring the mixture to a simmer, until everything is heated through. Serve with grated cheese, a dollop of sour cream and a handful of baked tortilla strips. Fresh cilantro would probably be quite nice as well. Enjoy. Greetings from the professor! Awesome stuff here! Should I try it? It always flops for the professor you know? It’s entirely up to you if you want to try it! I HAD NO IDEA HOW AWESOME THESE WERE. Will grow some this year. You have converted me. Actually, you had me at the freezer bags. From the freezer bag to fresh salsa in a snowstorm in no time flat. Yes, you should definitely grow these. I might attempt them. My husband and I agreed never to grow tomatoes again. I just can’t keep up with the pruning, the staking, the massive growth and the crappy quality of the fruit, even when I buy nice heirloom varieties. Maybe tomatillos are a little less labor intensive? I am truly not much of a gardener. Heirlooms are the hardest tomatoes to grow – and they don’t produce that much fruit. Tomatillos are definitely less labor intensive. They need to be staked, but not pruned. Just be sure to give them enough space (more than tomatoes) and they will do fine. I will note however, that one year, most of the tomatillos didn’t ripen until right about the first frost. This past summer, they ripened early and just kept coming in.